Stock Interiors is proud to offer the highest quality	bow style Headliner Conversion kits available. If the old headliner is damaged beyond repair or missing, this headliner is the best replacement method. 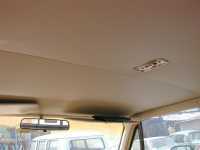 The old headliner may be discarded, support bows are included and fitted to the roof (drilling is required). The new headliner is glued in, much like an earlier bow supported installation. No special tools are required; instructions included. The converversion headliner kit replaces the original board with a bow style headliner, giving your vehicle a complete and finished look.